HMART'S SMART APP - DOWNLOAD NOW! 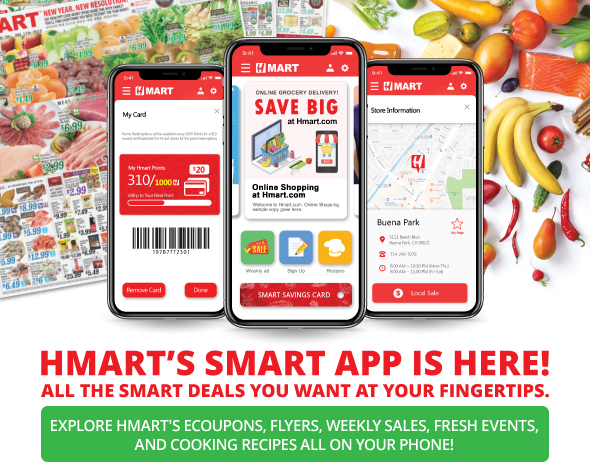 DOWNLOAD THE NEW HMART SMART APP NOW! ALL THE SMART DEALS YOU WANT AT YOUR FINGERTIPS. AND COOKING RECIPES ALL ON YOUR PHONE! [Smart Card] Customers now can scan smart card, register new smart card and check smart saving points right in at your hand! [Weekly Sale & eCoupon] Customer now can view all available weekly deals and eCoupon for each H Mart stores! [My Favorite Stores] Save your favorite stores in the App to access to the deals much easier and faster. [Our Story] Find out what is happening at your most favorite H Mart store, be a part of it, and enjoy. [Recipes] Korean kimchi to Chinese dim sum; from Asian Cuisine to western dessert. Customers can find more than 100 recipes. That's nice and can wait to download and use it. Yes,I need a H-mart app. Wonderful plan and I am waiting for download app. Yes!!! I’m so excited!! Also, when is your Katy store opening? This is awesome! I have been waiting for the feature and option for a long time. The best store for fresh veggies,meat and fish Everything is clean. Great customer service. I want the best when I shop and it is a treat to have this quality of a one stop store in my neighborhood. Thank you for all the effort you put into making this happen. Is the app called Hmart? I just tried on Apple App Store & nothing.